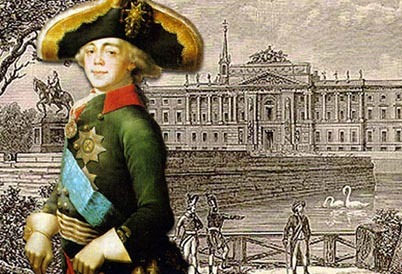 Pushkin's words about empress Catherine II are well-known: "the End of her reign was disgusting... All were indignant; but Pavel was coronated, and the indignation has increased ... Pavel's Reign proves one: and in enlightened times Kaligulyes can be born." However the poet and mason A.N.Radishchev returned by Pavel from a Siberian exile named these times differently and probably is more exact: "The Century is mad and wise". Our homebrew Kaligula, great Ekaterina's son, the clever, educated and kind person who has been tired out by brutal Russian history in deadlock of political madness and hysterical tyranny, the most lonely, unfortunate and not understood figure of XVIII century was that also. Reign of emperor Pavel I became the last unsuccessful even tragicomic attempt to finish Peter the Great reforms that is force to impose "from above" to lax, completely got spoilt at indulgent empress Catherine II, Russia correct European forms and a Prussian order in all spheres of its free and boundless life. However very few people wanted it, and contemporaries regretfully spoke about Pavel: its Reign for all was extremely heavy, especially for those who got used to be a benefactor under mild board adored Queen. Therefore to the romantic Emperor-knight the name of Russian Quixote given to it by ironic Napoleon's has more stuck. In this short, but extremely important for all subsequent life of Russia, a history interval many destinies of the country, a monarchy, nobility, various social movements and capital ideas was defined . The Orden of free masons was not here an exception: the Russian freemasonry crushed by Catherine II, stayed in that time in voluntary silence ("silanum" by the Orden terminology), confusion and inactivity. "Diligence to a regal Orden everywhere has died away, and its sacred works have fallen into decay", - was told in one Masonic manuscript. As always in such cases happens, persecutions only have aggravated becoming ripe crisis of Russian freemasonry which has appeared necessary and fruitful, has opened road to new people and ideas. At the same time the secret orden has kept the basic shots and the organisation, members were ready to renewal Masonic "regal work" and former Orden activity. Time for salutary crisis of Russian freemasonry was as a whole favorable, though also vague. Even court doctors and teachers of music and other sciences were entirely Germans and entirely masons from Cinnendorf lodges of baron von Rejhel. Huge and quite benevolent interest of the future emperor Pavel to a freemasonry, its philosophy, aesthetics and practical ethics is obvious. In the Orden was the Prussian king, the writer and musician Frederich the Great (to whom Pavel since childhood worshipped and imitated), and unfortunate and ingenuous Peter III, the father of the future Russian emperor. Grand duke Konstantin Konstantinovich has found out in magnificently bound in red with gold velvet of the Bible of Pavel I a mysterious "Masonic Addresses".
" Dark stains everywhere made the way through blinking of glory from vigilance impoverishment... Idea to wake and set all by freshen force was ontime, especially before a glow of the French revolution ". These secret expectations of an Orden concerned all spheres of Russian validity. Pavel should become such new figure, marking itself a new historical epoch and embodying in a reality plans and expectations of free masons in Russia. You love it by itself and honour! Clearly that speech here went about temples of free masons. But their hopes of protection of the monarch and legalisation of activity of an Orden have not come true, though Heraskov has received a rank of the privy councillor for the ode. Expected revival and updating also has not occurred, it became clear that freemasonry decline - a consequence not only of political reprisals byCatherine II or indifference of her son, but also radical and irreversible change of a historical and cultural situation in Europe and Russia. The historical encyclopaedia "the Freemasonry and masons: three centuries in Russia".